Myriam GHJ (AHR 31969-11) was born on April 21, 2011. Myriam is sired by Arno van het Nieshof, a 2-time AHR ‘National Champion Stallion’ and the only AHR ‘Supreme Status’ stallion in the country. Myriam’s dam is the AHR Silver Classified mare, Mythical TOF. Mythical is sired by the AHR GOLD Classified stallion, Aristocrat TOF. Aristocrat is one of only two AHR GOLD Classified stallions in the country. Mythical’s dam was the great-producing mare, Malvina TOF. Malvina was imported from Austria by Tudor Oaks Farm as a yearling. Malvina, who herself became AHR Silver Classified, was known through the years of haflinger breeding history for her role in producing multiple AHR Silver Classified daughters. This maternal line is renowned for passing down quality from generation to generation. In addition, Malvina’s sire, Andrit, is a well-known producer of excellent broodmares in Austria, adding even more generational quality and substance to Myriam’s dam’s pedigree. Myriam carries the ‘GHJ’ suffix as she was bred by the AHR Inspector and top-breeder, Joel Greenisen. Joel Greenisen of Greenisen Haflinger Farm in Ypsilanti, Michigan, was at one time the president of the AHR and the World Haflinger Federation for the United States. Sadly, Joel passed away in 2011 and Myriam was one of the last two foals that were born on his farm. It was with great honor and pride that Myriam joined Genesis Farm in the Fall of 2011 and that in doing so, part of Joel’s coveted breeding program could be intermingled with our own. Myriam’s show ring debut was with Genesis Farm at the AHR Futurity in October 2011. Myriam was the 1st place entry in the very competitive ‘Junior Weanling Filly’ class. She went on to be named the 2011 ‘Junior Weanling Champion’. In the Pleasure SIP Class out of 23 entries, Myriam placed 3rd. She was the highest-placing foal in the class from the junior division category, which was an impressive win for such a young foal. As a side-note, 1st and 2nd place in the large SIP class went to Myriam’s stable-mates, ‘Accolade of Genesis’ and ‘Mariah GHJ’. 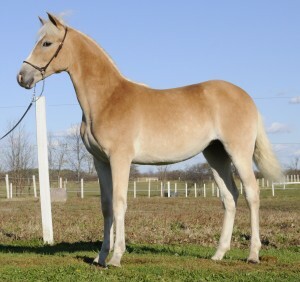 Myriam is a tall and modern filly that combines excellent conformation, movement and type into one fine package with a pedigree that is sure to pass on these traits for all of the future generations!